I came to know and love this verse in college. It has seen me through many times – good and bad. I wrote it on the white board in my hospital room during our fight to save our baby. It was a reminder to keep my head and heart in the right place. 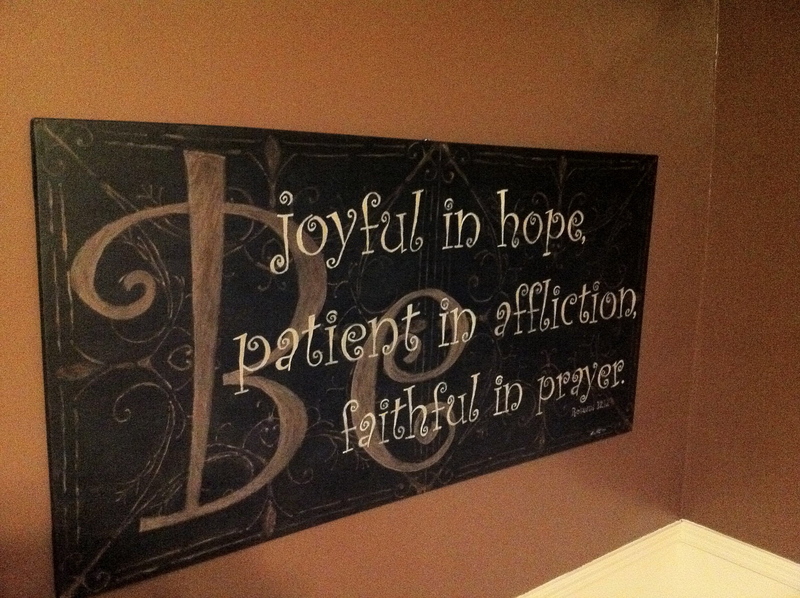 be joyful in hope – There is no question I was not happy. Who could be? But joy is different. Joy is the comfort and peace of knowing that God is in control, even when the outcome isn’t what we want. Joy comes from hope, which God offers in abundance through the promises of His Word. There are so many other verses I will share that gave me his hope. This verse reminded me to hold on to joy. be patient in affliction – spending a month in the OB ICU certainly qualifies as “affliction” to me and I must admit I was anything but patient at times. No matter what you are going through, it is hard to be patient. We want answers and results now, and at no greater time did I feel this than when I was fighting for the life of my child. But God’s time and ours are often not the same, and we may never know why (He doesn’t owe it to us to let us in on the reason). This verse reminded me to wait on Him. be faithful in prayer – Have you ever had to pray the same prayer for a long time? At first the prayer is intense, but over time you almost just don’t know what to say. I went through a time when just couldn’t find the words. This verse reminded me to claim God’s promises and pray faithfully through it all. For more than a decade I have clung to this verse as my “life verse” – the one I live by and return to time and time again. It has been on my screen saver, my bathroom mirror, post-it notes, and e-mail signatures. I pray it will be a powerful reminder to you today as well. For our 10th anniversary, my husband (a very talented artist) gave me the most incredible gift. He painted “my” verse on a huge canvas for our newly remodeled dining room.